When evaluating customer experience you need to Integrate and assess both operational data (O-data) and experiential data (X-data). While many organizations are rich in operational data, few have sufficiently acquired and utilized experiential data, yet this X-data is critical to enabling today’s companies to be disproportionately rewarded for delivering great customer service. To get a true understanding of customer service and customer satisfaction, you need to insure the organization is careful collecting and report both operational and experiential data findings to see whether your operation has happy customers and you are truly competitive. Nowhere in the organization is the need for operational and experiential data to converge than in the call center operations. Within the call center you have a plethora of operational information – number of consumer calls, wait time, abandoned calls, call resolution, length of the call, etc. However, access to experiential data is non-existent or extremely limited and often difficult to analyze. Experiential data tradition is collected through post-call surveys utilizing both open-end and closed-end data. Additionally many call centers record agent conversations, however this qualitative data asset has been extremely underutilized for CX purposes. In most organizations, the operational and experiential data are silo’d. Call center operational data is typically used for agent training and to assess call center efficiency to improve performance. This operational data is giving insight on the past operational performance, looking backwards. Experiential data is used to assess customer experience as a means to better understand the interaction with agents and the company’s policies and products and their impact on customer loyalty and sentiment. Experiential data is the best indicator or future brand performance, thus its a forward performance indicator. If you don’t integrate operational and experiential data in your CX assessment you are only getting part of the customer picture. As Ryan Smith, CEO of Qualtrics, explains it, the operational data tells you what happened but the experiential data tells you why it happened. Customers have come to expect real-time response from brand interaction, and integration of operational and experiential data has to be delivered in real time to keep pace. Operational data represents the past, what transpired, but experiential data represents the behavior and sentiment of the consumer which is an indicator of future behavior. In short, how to provide the service and product experience that motivates the customers to love your brand. With real-time CX surveys and analytics you can bring together operational and experiential data to shorten time to customer insight and action. We are finding that voice-driven IVRs and real-time speech-to-text transcription are essential components of customer experience solutions that combine real time data collection and integration delivering immediate insight into customer experience. For example, conversations captured and analyzed in real time during call center interactions can be quickly transcribed and analyzed to gather immediate experiential data. When you add in voice-driven surveys delivered immediately following a call center transaction, you gather a complete picture of CX with actionable insight that lets you respond to issues in near real time. As brands continue to look for ways to differentiate themselves by enhancing their customers brand experience, the marriage of operational and experiential data is going to become essential to get a true portrait of customer experience. Those brands that can integrate that data in real-time will be the winners in the race for better CX. As customer expectation grow, winning brands will have integrated data and analysis not only to understand what has happened, but to predict what their customers attitudes and needs will be to insure continued customer delight. Customer satisfaction surveys have become an essential part of marketing. Many online sales, telephone support call, and customer exchange is followed by a customer satisfaction survey, and most of those surveys are absolutely useless. When the customer satisfaction ratings become targets, then the insight from customer feedback disappears. To be effective, customer surveys need to be open, unbiased, and untargeted to get authentic customer views; insights that are actionable. 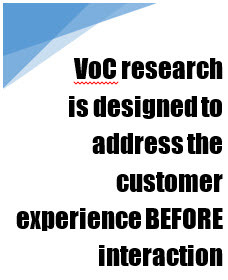 That’s why we are seeing more call center clients adopting voice driven research™, leveraging voice open ends increasing the quality and quantity of qualitative open end response data. The value of customer satisfaction research has been demonstrated again and again. According to a recent survey by The Temkin Group, 87 percent of customers surveys indicated that their 2016 investment in customer experience (CX) research has a positive impact on business, as opposed to 79 percent in 2015. As a result, 66 percent of companies are increasing spending on CX studies, including a nine-fold increase in headcount. Most of that spending is going into voice of the customer (VoC) software, predictive analytics, and experience design. Customer satisfaction surveys can help fuel CX research, but only if they gather unbiased results that reflect the true voice of the customer. What’s wrong with customer satisfaction surveys is they become self-fulfilling prophecy. Too often, a company uses customer surveys as a means to gauge call center or service performance, using a score as a target threshold. Surveys become a “shop, rate, reward” system integrated into customer interaction and designed to generate a score, or target. This type of metric is flawed when gauging true customer experience. Goodhart’s Law, developed by British economist Charles Goodhart, states that once a measure becomes a target, it can no longer be used for valid measurement. By way of example, Goodhart points to Soviet factories producing nails according to a target. If the target is to produce a specific number of nails, the factory produces more tiny nails to meet the target. If the target is based on weight, the same factory retools to producer fewer, heavier nails. In both cases, the target doesn’t reflect true value. Rep: “Great, then can I count on you for a 10 out of 10 score on our customer satisfaction survey? In general, everyone wants to be helpful so you will consistently get survey results that skew positive. In fact, many companies assess call center performance using post-call surveys and anything less than a 10 out of 10 is considered unsatisfactory. To get true customer sentiment and honest customer feedback, you have to separate the survey from employee scoring. The best approach for accurate, actionable insight is to avoid scoring altogether and opt for open ends, where customers get to share their true opinion. Complete responses to complex questions. Open ends allow customer to explain. This has at least two benefits: 1) it provides a more comprehensive response to the questions and 2) it cements customer relations by giving the caller a chance to be heard. It tells you how customers think. How you administer open end questions also has an impact on the quality of response. You can use written surveys, which will give you genuine feedback that is easy to add to your database for data search. However, given the rising degree of survey fatigue, consumers are losing patience with answering surveys, and written surveys may not generate the response rate you want. Voice capture adds another layer of authenticity to feedback surveys. Mobile phones in particular have become a popular tool for IVR surveys. Two-thirds of Americans own smartphones and use them for online data access as well as telephone calls, so targeting smartphone users gives them options on how to take the survey. We have found that most consumers prefer voice driven surveys because they are faster and easier, which is an advantage for call centers since voice responses capture the true voice of the customer. With new speech-to-text transcription technologies, companies are seeing an error rate of 7 percent or less for transcriptions. This makes transcribed voice driven research accurate and incredibly useful for call centers. Transcriptions can be generated in near real-time, making it easy to search algorithms that can flag customer issues that need immediate attention. And the original voice file can be preserved for tone and deeper insight. The result is customer satisfaction response that is easy to capture, more accurate, and most importantly, immediately actionable. Targeting customer satisfaction provides a false positive that will lead your company in the wrong direction. If you truly want to gauge satisfaction, don’t lead your customers, just ask them what they think. If you provide a forthright and easy way to respond, such as voice response, then you will get more accurate results that will lead to better business decisions. Customer experience (CX) research has been experiencing dramatic evolution in the last decade which has, in turn, changed CX strategy. In recent years customer satisfaction research has been turned upside down by the rapid evolution of the digital customer experience. The historical norm of siloed customer satisfaction survey projects reported on a monthly or quarterly basis has evolved into real-time omni channel data collection spanning the entire customer journey, from acquisition to long-term client retention and value growth. Further, there is a new demand to integrate all employees into CX reporting and motivation. Every employee in the company has an opportunity to enhance the customer experience, which has driven CX vendor to deliver multi-level reporting that integrates analytics spanning survey, social data, operational data, etc. The goal today is not to simply report on a customer satisfaction metric, rather it is to make customer satisfaction an integral component to company strategy and employee motivation. To achieve this goal, CX vendors must look for best of breed solutions throughout the customer journey. One such solution is the Voice Driven Data Collection™. Voice Driven Data Collection utilizes telephone and mobile devices to maximize the opportunity to capture both quantitative and qualitative data within a omni channel environment by converting voice response into actionable data. The premiere survey methodology for capturing voice driven data is IVR surveys. IVR offers a flexible survey methodology for mobile consumer enabling voice and keystroke-driven input. Statistics show that IVR surveys tend to provide the highest response rates in outbound survey methodologies, and they offer the ability to gain insight immediately after a consumer interaction with a call center. What this means is that a broad demographic population can provide survey data response that reflects a more accurate representation of the consumer’s experience with rich quantitative and qualitative data. More importantly, IVR surveys uniquely enable an ability to capture responses through open ends, the actual voice of the customer, providing actionable attitudinal and ideation insights to understand the “why” of consumer CX measurement. This ability to capture consumer voice is particularity important when considering the dramatic decline in open ended data associated with web, mobile, and text surveys. Integrating IVR survey data collection is a key component to making the Voice of the Customer actionable in today’s CX strategy. Customer support call centers continue to be one of the most influential customer experience (CX) touch points in your customers’ journey. Designing and executing customer experience call center CX feedback systems should be one of the highest priorities in any enterprise CEM solution. Unfortunately, for many brands a one-size-fits-all methodology has been used to develop survey and feedback systems to interview customers about their experience following call center interactions. Our experience suggests that the survey methodology and system design needs to align to the unique aspects of customer care call center management. 1. Acquire customer experience quickly. The best data from customer care and call center service interactions need to be acquired within minutes after the termination of the call. Best of breed solutions use an instantaneous, event-triggered system to engage a consumer who has opted in to a survey. This event triggered surveys offer the highest response rates and the most concise feedback on call center CX. 2. Sentiment data is king. Consumer sentiment is recognized as a key indicator of customer experience and an important metric for customer care. Many vendors wait to measure sentiment in post engagement text analytics processing. Voice driven data collection systems using IVR and speech-to-text models can measure consumer sentiment scores in real time and monitor for keywords and phrases enabling alerts to be delivered for direct intervention by customer care representatives. 3. Integrate operational and research data. Strong analytics are key to managing agents’ performance and making insights actionable. One way of enhancing call analytics that is often overlooked is integrating survey data with operational data. The seamless integration of survey and operational data, including agent ID, is critical to generating comprehensive analytics that can render actionable insight. Survey data system should integrate through API into the call center data allowing seamless integration on the front-end rather than requiring post survey manual integration of operational data. 4. Open-ends are critical to making NPS actionable to the brand. Qualitative insights drive ideation that enables the brand to take action to make measurable improvement in NPS scores. Unfortunately, mobile and text survey have had a direct negative impact on the quantity and frequency of consumer open ends. The only survey methodology that has consistently delivered rich open end data is IVR surveys. Consumers tend to give open end responses that are 3-7 times longer than other survey methods. In addition, with speech-to-text technology these voice open ends are more actionable and cost effective than ever. Market pundits have predicted the decline of call centers as a critical component of consumer care. In reality, call centers continue to be the single most important component of consumer care in the digital age. Research shows 69 percent of consumers are more satisfied using the phone to acquire support across most industries, something you could test with your own call center IVR surveys. Further, at a cost of $1.00 per minute, Call Centers represent the single most expensive customer care system cost by a large margin. Because of the volume of consumer contacts and their relative impact on consumer satisfaction, call centers have always been considered a critical touch point in the customer journey for all customer experience CX research. Further, multi-modal surveys have been used for post call center surveying, but IVR surveys have been the dominant and preferred survey method. New trends in customer research will further expand the use of call center IVR surveys for post call customer care. Call center operations are beginning to integrate speech to text technology as a scalable method to review and analyze the performance of agents, and coaching agents to enhance success metrics. Speech to text captures the customer exchange and transcribes it to make it easier to analyze and dissect call outcomes to assess agent performance. This technology will enable call center management to better understand the causes of successful and failed customer care calls. What the technology of transcribing actual consumer call recordings will not provide is a clear understanding of the impact customer care and service call successes and failures have on the customer’s relationship to the brand. This can only be achieved by an effective and broad-based post contact survey methodology. IVR surveys continue to offer the preferred survey methodology because it offers nearly instantaneous post call or service contact, extremely high participation rates, a mobile friendly platform, and the ability to gather quantitative and qualitative feedback, including insight into brand affinity. The qualitative data acquired by IVR surveys has dramatically improved and is more cost effective with the integration of similar speech to text technology. Now you can transcribe survey open ends and integrate such data for text analysis and ideation research in near real-time a fraction of the cost of manual transcription. As call center innovation grows so does the ability for customer experience research to measure the attitude of consumers and score their experience to measure the impact on consumer brand affinity. We can help you get more from speech to text IVR surveys – learn more. Even though they talk to customers via telephone, email and chat, the most siloed operation in your customer service operation is your call center. Historically, call centers have been segregated from other parts of the organization concerned with voice-of-the-customer (VoC) issues, which is odd since no other group works directly with more customers every day. Collecting and, more importantly, sharing customer experience (CX) data should be one of the primary responsibilities of the call center. Telephony partners often have a stake in controlling the feedback related to their platforms. More call centers are being outsourced, which makes it harder to integrate call center reports and findings. Call center business processes including workflow and software, differ from other VoC groups making it more difficult to integrate call center data. Despite these obstacles, call centers are front and center when it comes to assessing CX and customer satisfaction. The data they gather as part of the omnichannel experience can help make or break your brand. …in a world increasingly built around collaboration, CX outcomes tend to diminish when marketing or any other single department attempts to lead and execute CX alone. CX leaders need to partner and collaborate with other departments to make improvements throughout the entire client life cycle. No one group listens to the customer more closely than the call center. Call centers tend to be the single, most impactful operation affecting net promoter scores (NPS), which means they have a huge impact on CX. 55 percent of VoC leaders have higher customer retention rates. 23 percent see a reduction in customer service costs year over year. 292 percent experience greater employee engagement rates. Call centers are at the forefront of VoC data gathering, generating more qualitative and quantitative transactional data than any other CX group. Ignoring call center findings and failing to incorporate them in CX analytics is a costly mistake. Once you understand the vital role that call centers can play in VoC data gathering you can break down the barriers and integrate call center CX data into your analytics workflow. It also allows you to make the most of the unique role the call center plays in assessing CX. Establishing the right protocols for customer experience data gathering has to be part of multichannel CX analytics. You need to establish customer surveys that provide an accurate snapshot of customer attitudes. You also need to be able to process open end questions as well as multiple choice and ranked responses. More importantly, you need to be able to process real-time data as well as historical data. To increase customer retention rates and reduce customer service costs requires immediate response to customer issues. Having a real-time data analytics engine providing immediate reports based on customer-agent conversations is the kind of big data application that can give your customer service operation a true competitive edge. It’s time to bring your call centers in from the cold. The more closely you can integrate call center data gathering into your omnichannel strategy, the more comprehensive your understanding of customer experience will be. You also need to take advantage of the call center’s unique role as the direct channel for customer contact, using timely IVRs and real-time analytics to improve customer satisfaction. Customers have come to expect more from brands as more digital communications and service channels become available for marketing and customer outreach. Today, customers can interact with vendors through their call center, their web site, via chat, via email, and using social media. This puts even more pressure on companies to assess and manage customer experience (CX). The days of using email surveys as the single feedback channel are over. CX vendors and their customers need to adopt a blend of CX data collection tools including IVR surveys, email surveys, web intercept, and other tools that are better suited to the unique diversity of service channels. In short, single survey mode strategy is dead, accurate CX measurement requires a multi-channel survey strategy. l that that encourages response in order to get an accurate net promoter score (NPS). To capture accurate customer feedback you have to understand the impact of the most recent consumer interaction. Emailing customer surveys days or weeks after an engagement gives you a less than accurate picture since you have no idea what interaction the recipient is responding to. To get an accurate NPS or consumer satisfaction score, you need real-time surveys that relateengagement to the last transaction. For this reason survey best practices always focus on modes that offer near real-time data collection following the customer journey event. If they are on web page, an intercept is preferred. If they are calling into a call center or scheduling field services, a voice survey is best. Both examples reflect a convenient and timely data experience collection method. A survey received immediately after a successful purchase, either in-store or online, will be colored by the brand experience where a survey following a customer concern issue will be colored by the service experience. To get an accurate NPS you have to balance the nature of the interaction and the timing of the survey as well as choosing the right channel. For example, more consumers expect companies to help them find their own answers, and how quickly they find answer to their questions affects brand perception. Fifty percent of consumers believe it is important to solve their own product and service issues, and 70 percent expect the company to have the right answers available online. If a web site search fails to yield the right answers, it adversely affects CX. To make this more complicated, consider that call center volume has dropped 15 percent in the last three years. However, what we are seeing is an escalation of customer service issues being handled by the call center. Lost orders, product issues, service issues, and other problems are being routed to the call center. Closed-loop surveys are likely to be colored by the reason for contacting the call center as much as the quality of the response. To assure accurate CX feedback you need to consider both the medium and the message; the preferred channels the customers choose as well as the nature of the interaction. To level the playing field and generate more accurate, reliable CX data, choose a response mechanism that suits the channel and generates higher response rates across all channels. Having consistent benchmarking tools will help generate a more accurate NPS. We have found that companies that use a mix of best-of-breed survey tools for each channel will gain better insight, and that for call centers voice-driven IVR surveys are the best survey tool and yield a higher response rate. Thirty-two percent of consumers have singled out telephone support as the most frustrating way to interact with vendors. Being able to respond quickly with voice-driven IVR surveys can assuage some of that frustration and with real-time transcription tools those responses can be immediately optimized for a more accurate NPS. CX vendors and brands need to determine the right mix of channels and multi-mode surveys to get valid customer response data. Mixed-mode survey strategies that include email, IVR voice surveys, telephone surveys, and other mechanisms have to be part of the mix for successful closed-loop service recovery as part of today’s multi-channel service strategy.